The ﻿Department of Catalysis and Chemical Reaction Engineering at the National Institute of Chemistry is a project partner cooperating on Biopharm.si projects RRP4, RRP6, RRP7. Our main tasks are related to the simulation of biological drug production process. Results of our study will serve as a tool for biopharmaceutical process development integrating up-stream and down-stream processes, and for further optimization, monitoring, and quality control. Figure 1: Department of Catalysis and Chemical Reaction Engineering at the Slovenian Chemical Society Annual Meeting 2017 in Portoroz. Biopharm.si team are represented by Miha, Miša, Drejc and Uroš. 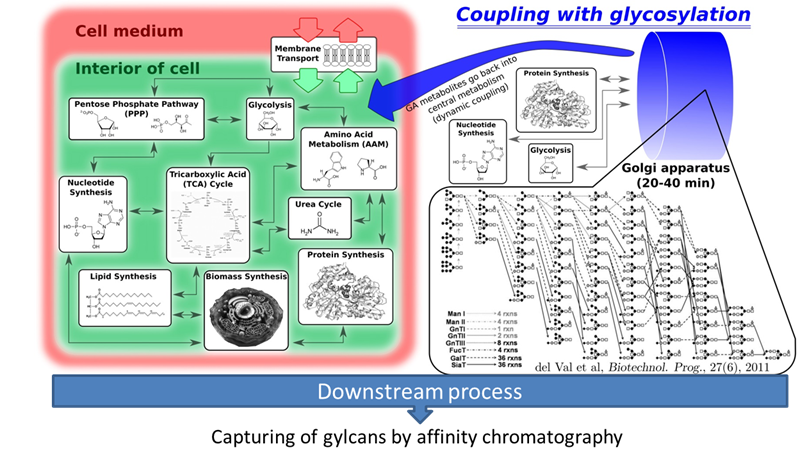 a link to the down-stream processes and to novel (bio)process design via protein N-glycosylation coupling. Our mechanistic model for mammalian (CHO) cells metabolism is based on the metabolic network consisting of approx. 100 micro reactions within the cell. The following processes are included in the reaction pathway: glycolysis, tricarboxylic acid cycle, pentose phosphate pathway, anaplerotic reactions, amino acid metabolism, urea cycle, lipid, protein and biomass synthesis, and membrane transport (Figure 2). Figure 2: Coupling of Cell metabolism and protein N-glycosylation. The end products are glycans (biological drugs). At the Slovenian Chemical Society Annual Meeting 2017, Miha had a lecture on CHO cell metabolic flux analysis, and Jernej presented the poster on Hybrid bioreactor model with improved CHO cell biomass growth dynamics and metabolomic glycosylation module. Our results were also presented at the 2017 AiChE Annual Meeting in Minneapolis, USA, where Uroš had a lecture entitled Model-Based Process Optimization for Upstream Bioreactor Production–Downstream Chromatographic Separation of CHO Cell Monoclonal Antibodies (mAb). The presentation is available here. If you want to collaborate with us, drop us an e-mail: blaz.likozar@ki.si, uros.novak@ki.si, miha.kastelic@ki.si, misa.cajnko@ki.si, drejc.kopac@ki.si. Workshop on "High Content Imaging and Data Science for Virtual Screening and Drug Discovery"